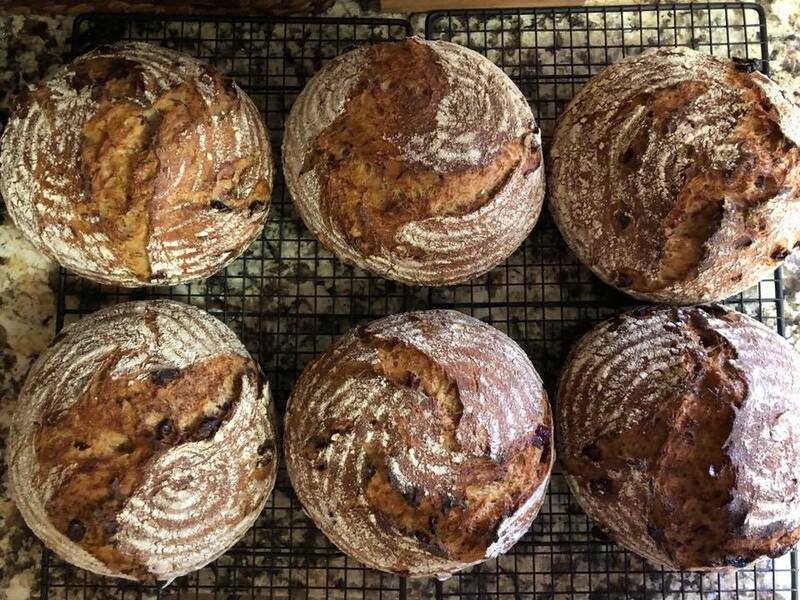 This is a repeat of the Spiced Raisin Sourdough that I did a few weeks ago with a few changes, of course. ;-) I switched out half of the golden raisins for cranberries and I changed up the method quite a bit. It was a pain in the neck and made for a very long day (I started at 7:30 am and finished at 8 pm) but I think the results are worth it! 670 g water (split into 620 g + 50 g portions) plus another 10-15 g or so. A couple of night before making the dough, mill the red fife berries and sift out the bran. Mill the bran again on a finer setting. Reserve both the bran and the sifted red fife flour for the levain. Since I need a total of 234 g for the levain, measure out 120 g from the 1000 g of unbleached flour and reserve that. The night before making the dough, soak the cranberries and the golden raisins in 620 g cool water. Make the mixed spice by combining the ingredients in the brackets. Set aside. Remember you will not be using all of this, just 3 teaspoons as stated. A couple of hours before the levain is ready, place the 880 g of flour and the 50 g ground flax in a bucket or bowl. Pour the mixed fruit with the water into the mix and mix as well as you can. Add the 50 g of water and work into the dough until all the flour has been hydrated. This was a pain in the neck when you are making 4 batches. Keep at it though and it will hydrate. Let rest covered until the levain is ready. Mix in 465 g levain and incorporate well. Another pain in the neck trying to integrate liquid levain into a stiff dough. Cover and let rest in a warm place for 1 hour. Mix the cinnamon, mixed spice, salt into the kefir and set aside. After the dough has rested, spread water onto a counter and scrape the dough out of the bucket onto the counter. Spread it out into a large rectangle and spread out the kefir/spice/salt mixture onto the dough. Roll up the dough like a jelly roll and then roll it up the other way. Do a 150 French slaps and folds on the counter to distribute the salt and the spices. My hubby just loves hearing me slapping dough on the counter about a half hour with those four batches. He asked me on the fourth batch if I was done beating the dough! Place back in the bowl or bucket, cover and place in a warm spot to rise. Do 3 sets of stretches and folds one hour apart. I wet my hand for each fold to add a little more hydration as I felt the dough was pretty stiff. Adjust how much water you use, if any, according to what you are comfortable with. Then let rise until the dough has risen 50-60%. Scrape dough out gently onto a lightly floured counter and divide into portions of ~830 g. Gently fold the portion in half and round out the dough with a scraper and your hands. Let rest covered with a tea towel for an hour. Do a final shape by gently cinching the dough à la Trevor (gently pull one side and fold to the middle, pull the other side and fold over the first side, roll the top towards you and gently pinch into place and continue rolling until the seam is underneath). Do not deflate the dough at all. Place seam side down into floured bannetons, cover and put to bed in the fridge for the night (~12 hours). The next morning, heat the oven to 450 F with the Dutch ovens inside for at least 45 minutes. Place parchment rounds on the bottom of the pots and gently drop the boules inside seam side up. Cover and drop the temperature to 425 F, and bake for 25 minutes. Remove lids, admire the huge ears on the loaves and then bake for another 20 minutes at 400 F or until the insides measure 205 F. This is a change from my usual temperatures since the bottoms of my first batch were borderline burnt when using those. Cool for at least a couple of hours before cutting and enjoying! I had bit and pieces of dried fruit leftover from the holidays and I also had some local made grain free spiced granola that I had bought at the farmer’s market. The granola was rather expensive and there wasn’t a lot of it so I added the dried fruit and toasted groats to boost the volume of the add-ins. I am also continuing to sift the bran out of the whole grain flour that I mill and use that for the levain. The bran gets used for the first couple stages of levain building and I take some of the unbleached flour from the recipe to make up the rest of the amount needed. I suppose I could take some from the whole grain flour I just milled and sifted but using unbleached flour seems to make my starter very happy. A couple of days before making the dough, sift the bran out of the freshly milled red fife flour. Place the sifted flour in a bowl and reserve. Weight the bran and add enough flour from the unbleached flour amount to equal 132 g. Use this mixture and 112 g of water in total to feed 19 g of starter in 3 stages. This will make about 240g of a 80% hydration levain. My levain was ready the night before making the dough, so I put it in the fridge overnight. Place the rest of the unbleached flour in the bowl with the red fife flour. Add the buckwheat flour, the multigrain flour, the freshly ground flax seed, the granola, the currants, cherries and apricots. Cover and set aside. Toast the buckwheat groats in a dry frying pan. Reserve in a separate heatproof bowl. The morning of making the dough, add 700 g of water to the bowl with the flours and granola mixture, and mix well. Place the dough in a warm spot (82F) and let autolyse for 3 hours. Take the levain out of the fridge and let it warm up along side of the autolysing dough. Boil some water and pour over the toasted buckwheat groats. Let sit for one hour and then drain well. Mix in the kefir and cover. Once the 3 hours is up, add the buckwheat mixture, the salt and 240 g 80% hydration levain. Mix well and do 60 stretches and folds to integrate everything really well. Place the dough back in the warm spot. Ferment by doing 3 sets of stretches and folds 30-45 minutes apart and then one set an hour later for a total of 4 sets. Each set is only 5 or 6 folds going around the dough. Once the dough is billowy, has lots of irregular bubbles seen through the sides of the bowl or bucket and has bubbles around the edge, the dough is ready to be divided. The dough rose about 50%. This particular dough was ready in 4 hours. I am finding that if I do the autolyse in a warm spot, I can shave an hour or so off the time it usually takes for fermentation. Divide into 3 equal portions and preshape into a boule. Let rest 15 minutes and then do a tight final boule. Be careful not to degas the dough too much while dividing or shaping. Place seam side down in rice/ap floured bannetons and cover. Put to bed in the fridge for the night. The next morning, preheat the dutch ovens and the oven to 475 F for at least 45 minutes. Before loading the dough, place parchment rounds in the bottom of the pots to prevent sticking. Place the dough seam side up in the screaming hot pots and cover. Bake at 450F for 25 minutes. Remove the lids and continue baking for another 22 minutes at 425F. Not the best oven spring but they still look good. They were in the fridge for 17 hours so I wonder if that affected the oven spring. Just before Xmas, a friend’s husband had a heart attack and needed a bypass. I remembered Lazy Loafer’s Heart Bread and decided to base my weekend bake on her recipe. Of course, my friend ended up with a couple of loaves. 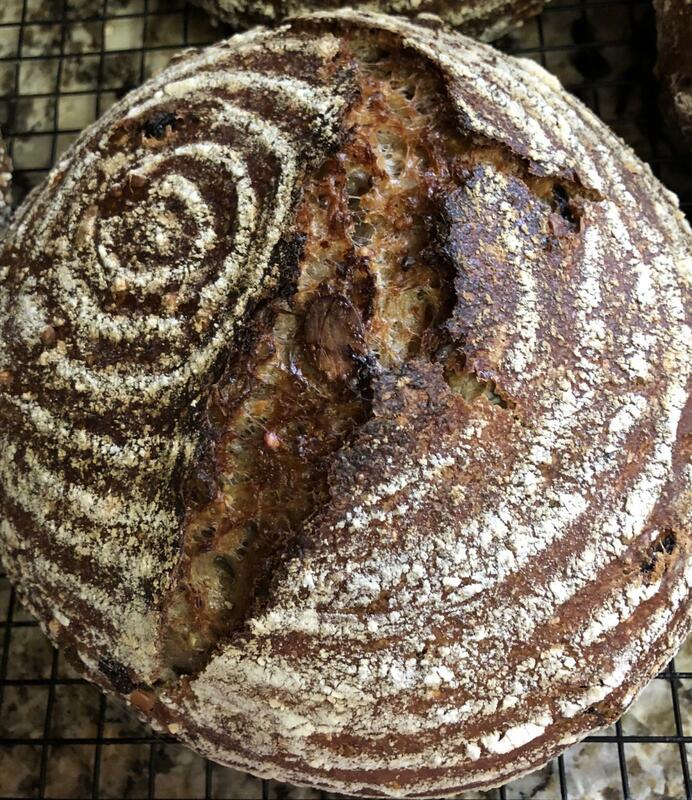 330 g bran levain (100% hydration) - See how to make this below. A few days before, sift the Spelt and Selkirk wheat flours and reserve the bran to feed the starter. Save the remainder of the sifted flour for the main dough. Weigh the sifted bran, the oat bran and add enough unbleached flour from the 550 g of unbleached flour to measure 142 g in total. Use this mixture to feed to 40 g of your starter in successive builds of your own choosing. I did a 4 stage build. Time your builds so that the levain is ready to be used mid day on the day you are making the dough. The bran really soaked up the water and was more on the dry side than anything. The levain also did not show much activity because of this. Mine only rose 50% once I used the flour portion which was during the last build. Just keep it warm and give it time, and it will do its thing. Add the remaining unbleached flour, the multigrain flour and the ground flax to the sifted flour. The night before making your dough, prepare the soaker. Add 180 g boiling water to the rolled oats and let sit overnight. The next morning, add the soaker and the 700 g of water to the combined flour. Mix well and autolyse for 3-4 hours in a warm spot. Sprinkle the salt on top of the dough and add the kefir and all of the levain. Mix well and add a few grams of water if needed. Once well mixed, I did 50 stretches and folds. The first few go well but the remainder end up looking more like kneading in the bucket than an actual stretch and fold. Place in a warm place for bulk fermentation. After 40 minutes, do a set of 8-9 stretches and folds. That is all the folds I could do without tearing the dough. Repeat after 45 minutes and again 45 minutes later. Do one more set of folds, an hour later. I was very gentle in order to not degas the dough. I let rise about 50% which took another 45 minutes. The dough was full of gas and bubbles were evident around the edges. Divide into 3 portions of about 820 g and preshape. Let rest 15 minutes and do a final shape. Sprinkle the bannetons with rice/ap flour. Place the dough seam side down into bannetons and cover the dough. Place in the fridge overnight or for about 13 hours. Heat oven to 475 F with pots inside for 45 minutes. Bake seam side up in preheated covered dutch ovens (lined with parchment rounds) for 25 minutes at 450 F and then uncovered for 22 minutes at 425F. Interior temp should read at least 205F. I few things to remember for next time: Bran really soaks up water so need to stick to 100% hydration or higher for the bran portion. Keep the dough warm during the autolyse as the bulk fermentation will go much faster. This time, the bulk was done in 4 hours as opposed to the usual 5-6 hours. The loaves got great oven spring. Probably the best I have had for quite a while. I was a bit surprised that the crust didn’t come out darker but this is probably due to the lack of sugar from honey or fruit in the recipe. Continuing my quest for a more open crumb and taking a page out of Dabrownman’s method, I sifted out the bran to use for the levain builds and changed my process a bit. Early in the week, I took 5 grams of my NFNM starter and placed it on the counter. To the 5 grams of starter, I fed it 15 g of water and 15 g of flour. This was a combo of white to wholewheat flour. The starter is quite a bit more active using all wholewheat rather than white or a combo of white and wholewheat. After peak which varied according to the type of flour it was fed, I discarded everything but 5 g and continued to feed it the above amounts. As to the combo of cranberry and feta, the idea came to me as I was eating a salad with those ingredients in it. I was going to just have the cranberries and the feta initially, but I felt that something was missing. So I thought that either Rosemary or sunflower seeds would go well with the cranberries and feta but I didn’t have any fresh rosemary so the sunflower seeds won out. However, I did find some dried rosemary in the spice drawer so I put a teaspoon in one batch to see how it turns out. Thursday night, milled the spelt, red fife and einkorn, and sifted out the bran. This gave me 26 g of bran. Since I needed a total of 142 g to feed my starter, I took out 116 g of the spelt, red fife and einkorn flour that was just milled and sifted, and reserved that as well as the 26 g of bran for feeding the starter. The rest of the high extraction flour was placed into the dough bucket. If you don’t wish to do this nonsense🙄, just reserve 142 g of the combined spelt, red fife and einkorn flour mix to feed to your levain. Thursday night, took 3 g of the starter and fed it 8 g of water and 9 g of bran. This makes for a very thick mixture. Friday morning, kept all of the starter and fed it 15 g of water and all of the remaining bran plus some of the reserved flour to equal to 19 grams. Once again, the mixture is very thick. It was placed in the oven with the light on and the door cracked. This creates a warm spot that is about 82 F.
Friday mid afternoon, kept all the starter and fed it 31 g of water and 38 g of reserved flour. It doubled in 2 hours!! I let it rise until it was no longer domed (5 hours). Friday night, once again, kept all of the starter and fed it 61 g of water and 76 g of reserved flour. I let it rise till doubled (2hours) and put into the fridge overnight. Saturday morning, the Levain was taken out of the fridge to warm up on the counter. After a couple of hours, it was stirred down and left to rise again. Saturday morning, to the mixed grain flours in the dough bucket, added 660 g unbleached flour, 110 g multigrain flour (Robin Hood Best for Bread multigrain), 50 g of ground flax seed, 150 g cranberries, 100 g crumbled feta and 50 g toasted sunflower seeds. Added 700 g water to the dough flour and mix until no dry spots are left. Autolysed for 4 hours. Added 40 g kefir, 20 g salt, 30 g water, and 240 of levain and integrated well. Used 75 stretches and folds until I felt that the dough was well developed. Put the dough in the oven with the light on as the dough felt quite cold. Fermented by doing 3 sets of (5 or 6 going all around the dough) stretches and folds 30 to 45 minutes apart at the beginning and then another couple of gentle sets at least an hour apart near the end. The dough was quite cold at the beginning of fermentation so it just sat there for the first 3-4 hours. It started rising during the 5th hour. The dough rose 30 to 50%, bubbles were present around the edges, and the translucent sides showed lots of irregular air spaces when it was ready. This took a total of 5 and a half hours! Note to myself: Put the dough to autolyse in a warm spot! Divided into three equal portions, shaped gently into boules and let rest for 15 - 20 minutes. I tried to shape in such a way that I got a taut skin but did not degas the boules completely. Placed the dough seam side down into floured bannetons and cover. Put into the fridge to proof overnight (~14 hours). I reduced the preferment flour in this recipe to 12% to try and extend the time in the fridge without risking over proofing. The next morning, 14 hours later, the loaves had risen about 50% is my guess. Preheated the oven and the dutch ovens to 475 F for at least 45 minutes. Placed parchment rounds in the bottom of the pots once well heated and carefully placed the dough on top with the seam side up. If you wish to score your loaves, proof seam side up and bake seam side up. I prefer the other way since I don’t have to deal with trying to score inside a screaming hot pot. 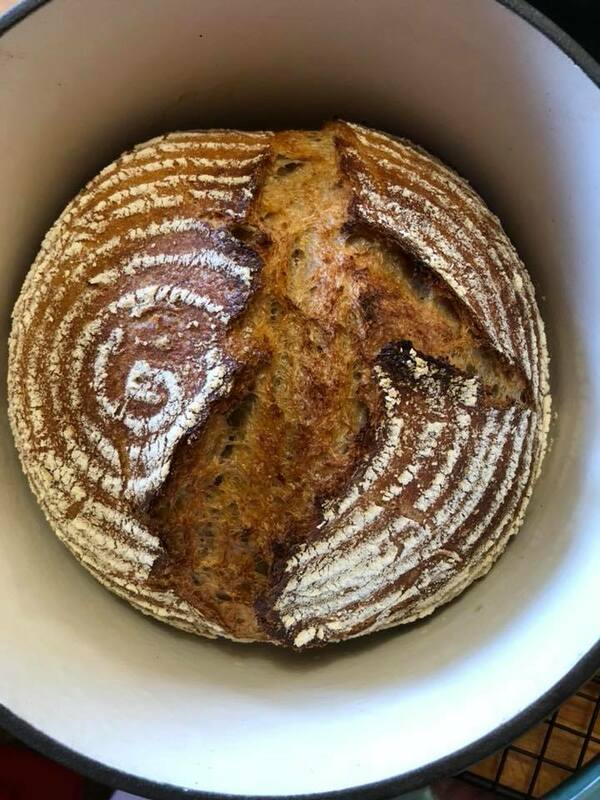 I have scored on the counter and then put the loaves in the pot and it works some of the time, but since I prefer the look of the natural tearing, I go with that. Placed the cover back on the dutch oven and baked at 450 F for 25 minutes and then uncovered for an additional 22 minutes at 425 F. Baked till nice and dark and internal temperature was at least 205 F.
I am very happy with the look of these loaves. I got very good oven spring and they smell wonderful! Crumb shot coming soon! ETA: Here is a shot of the second load. The 3 on the left have the rosemary in them. Longest dough prep ever and a few experimental trials! Since I got a few bread books as Christmas presents, (“Baking by Hand” and “Simply Bread”), I got a few more ideas for add-ins. As well, reading several of the posts (Leslie, Marianna, et al) on there in addition to Trevor’s book, I got inspired to try a few new things. One was the management of my starter. I fed it 1:2:2 for 3 feeds after removing a portion from my NFNM starter and then the last feed was a 1:4:5 to give me an 80% hydration starter which I prefer to use because the consistency seems to be easier for me to mix into my dough. Well the 1:2:2 feeds worked well by doubling after 7-8 hours. But the 1:4:5 feed also took 7 hours to barely double. Time was marching on so I used it even though it really didn’t feel very fluffy, nor had huge bubbles in it. If I redo this, I will make the starter the night before and give it a full 12 hours to come to peak. 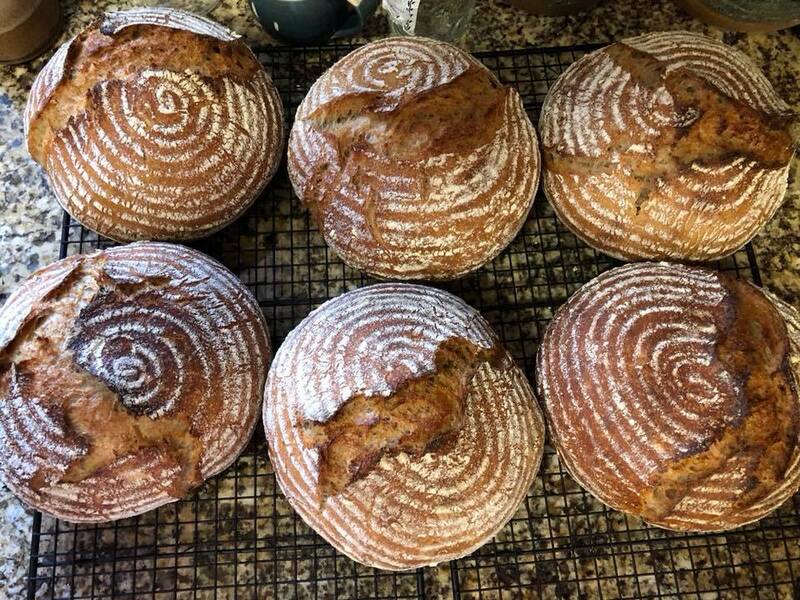 So far, I don’t see an advantage on changing my method of making my levain, but this new method might just need some tweaking (like lowering my expectations on how long it will take to double whenI feed it 1:4:5). 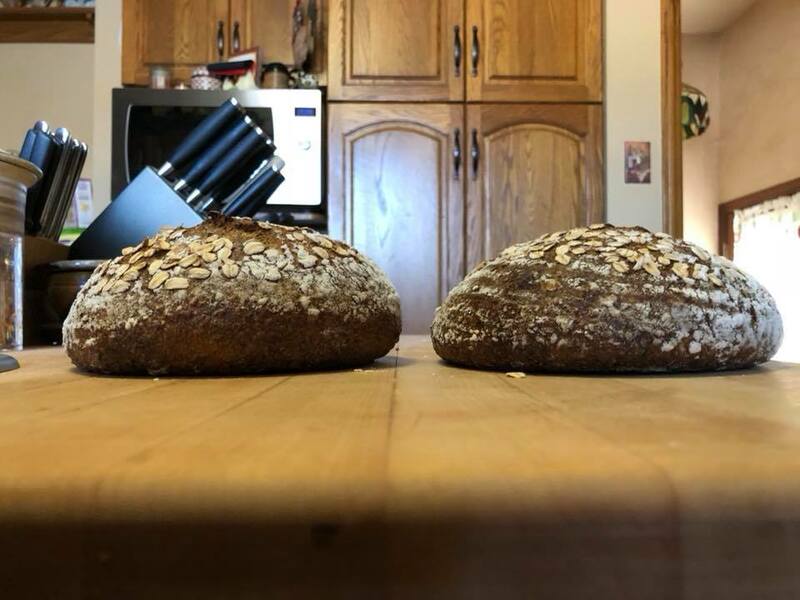 So the two breads that got inspired from “Baking by Hand” were a Cranberry Walnut and a Seeded Multigrain. Each batch makes 3 loaves. I used the same method for both loaves. 8 am Fed the starter 1:4:5 (30 g starter, 120 g filtered water, 30 g whole wheat/90 g unbleached flour) I doubled this since I was making a double batch of dough. I expected this to double within 4 hours as per my usual method but it was moving very, very slowly. Giving it a big feed really slows it down. 8:15 am Made up the seed mix and toasted it in a dry frying pan. I divided the seed mix into 350 g and 100 g portions and then set aside. 8:30 am Ground the walnuts for the Cranberry walnut loaves. Realized that I didn’t have enough walnuts so I added pecans. Chopped the pecans up with a knife and dumped the pecan/walnut combo into a dry frying pan to toast. Well of course the finer bits burned so I ended up picking out the larger nicely toasted pieces and threw out probably 30 g or so of burned crumbs. 10 am Checked the levain, didn’t seem to be doing anything. 11 am Mixed flours, ground flax and water so no dry flour was evident and left to autolyse at room temperature of 73 F. Kept watching starter move at the speed of molasses in January. 12 pm. Checked the levain, it had risen a smidgen or maybe it was my imagination. 3 pm Time was marching on and the levain finally barely doubled so I added the yogurt and Levain. Once well mixed in, I did 100 stretches and folds. The extended autolyse gave me a nice window pane even before the 100 folds. Kept dough on counter as I knew we needed to go out and I didn’t see the point of having it move too fast and then slow it down in the fridge. 3:40 pm Did another 100 folds. 4:15 pm Put the add-ins and salt through stretches and folds and once mixed in, and did the last set of a 100 folds. 4:45 pm Since we needed to go out (sis in law’s birthday), the dough was put into the fridge. 8 pm We got back at 8 pm and pulled the dough out of the fridge and into a warm spot which is the oven with the lights on. The dough felt really stiff and unworkable at this point. 9 pm The dough was still cold and I did 4 very gentle folds to avoid tearing the dough. This was more to let the warmth reach the interior. 10 pm Did another 4 gentle folds as the dough was still quite firm. 11 pm By this time, the dough was much more supple and I sort of followed the method outlined in “Baking by Hand” to strengthen the dough. I wet the counter as per Alan (Alfanso) and then folded the dough in 3 letter folds from side to side and then from top to bottom. Then, I put the dough back into its bucket and back into its warm spot. 11:30 Did another set of letter folds on the wet counter. The doughs felt really heavy because of the amount of add-ins. The book recommends doing these every half hour so I followed suit. 12 am Another set of letter folds on a wet counter. 12:30 am Last set of letter folds on wet counter. I then figured that I had manhandled this dough enough by now with the 100 folds, the letter folds, the killing it in the fridge and so on, that I would just leave it alone until it was ready to divide. At 1 am, I thought it was ready because I saw some bubbles on the edge of the tub but when I turned it out, it felt like a brick and not airy at all, so I put it back into the tub and back in the warm spot. 1:30 am Finally, at 1:30 am, it looked and felt much better. Funny what a half hour will do. I divided the doughs and gave them a preshape on a floured counter. Once shaped, they were left to rest about 20-25 minutes. Since I had 6 loaves on the go and none were for sale this weekend, this was the ideal opportunity for a few trials in baking methods. I had done the cold dutch oven/cold oven method as well as the hot dutch oven/hot oven method, but I hadn’t tried the cold dutch oven/hot oven. With 6 loaves, I could do all three and see what happens. I always put a round of parchment paper down first before placing the loaves in the pots to prevent sticking. Put one loaf of each kind in cold oven and cold Dutch ovens. Heat oven to 475 F. When oven reaches temperature, bake 20 more minutes. Then remove lids and drop temp to 425 F for another 22 minutes. Heat up the oven to 475F but keep the Dutch ovens on the counter. Once the oven reaches temperature, place the loaves in the cold Dutch ovens and load into the oven. Bake for 25 minutes at 450 F covered, and then bake 22 minutes at 425 F uncovered. 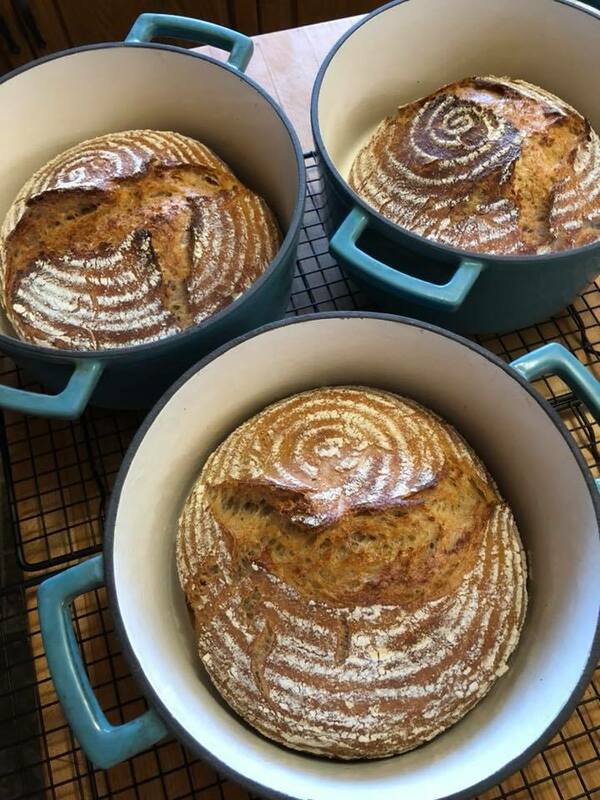 Heat up both the oven and Dutch ovens to 475 F. Place the dough carefully into the hot pots and bake covered for 25 minutes at 450F and then bake a further 22 minutes uncovered at 425 F.
Loaves are from left to right: # 1 baking method to #3. Seeded multigrain are in the back while the Cranberry Walnut (aka Pecan) are in the front. I don’t see many differences between the two cold Dutch oven bakes whether started in a cold oven or in a hot oven. The loaves don’t have a lot of rise and are more squat or of a larger diameter. They also don’t have much of the characteristic tears that I have come to expect from my breads. The ones baked in the cold Dutch oven and hot oven have practically none. On the other hand, the preheated Dutch oven and oven produced loaves that had more oven spring and do have that characteristic tearing at the top. They are smaller in diameter and just look more attractive to me overall. This replicates the results I got from doing method #1 and #3 in a previous bake. So in terms of what I prefer, the preheated method wins hands down and I will continue with it. I will try to get crumb shots when we cut into the loaves. Read more about Longest dough prep ever and a few experimental trials! My brother requested some bread to go with Xmas dinner so I went back to my adaptation of MutantSpace's bread and changed the seed combo a bit. This was also the bread that I used to do the experiment with baking in a cold oven with a cold dutch oven or baking in a hot dutch oven in a preheated oven. The wider loaves on the right were the ones baked in the cold combo pot and oven. They spread out more and ended up with a peaked appearance rather than a full rounded one like the loaves done in the hot pot and oven. Either way, the bread had a very nice mouthfeel and was delicious! 1. Toast 75 g of sunflower seeds and 50 g each of flax and black sesame seeds. 2. Soak the above overnight with 225 g rolled oats, 90 g of honey, 75 g of butter and 360 g of boiling water. 3. The next day, autolyse all of the above with 650 g water, 75 g freshly ground flax seeds, 550 g unbleached flour, 200 g of freshly milled red fife flour and 202 g of multigrain flour (I use Robin Hood's Best for Bread Multigrain flour). Let sit for at least a couple of hours. 4. Mix in 24 g salt and 266 g of 100% levain. Mix until everything is evenly distributed and you can feel the dough gaining some strength through folds. 5. Fermentation took about 4 hours. Fold 30 minutes to 45 minutes apart for the first 2 folds and then 45 to 60 minutes apart for the last few folds until the dough feels nice and billowy. I waited till I saw signs of bubbles around the edges. Normally, when I do this, my dough doesn't double but in this case, the dough was rising quite fast and it almost doubled by the time it was ready to be divided. 6. Divide into 4 and preshape into boules. Let rest 20 minutes and then do a nice and tight shape. I have been trying the shaping as shown in this video but I am way more gentle and I don't degass the dough the way Hamelman does. 7. Sprinkle the bannetons with rice/ap flour first and then some rolled oats. Place the dough seam side down into bannetons and cover the dough. Place in the fridge for 10-12 hours. 8. Heat oven to 475 F with pots inside for 45 minutes. Bake seam side up in preheated covered dutch ovens (lined with parchment rounds) for 25 minutes at 450 F and then uncovered for 22 minutes at 425F. 9. 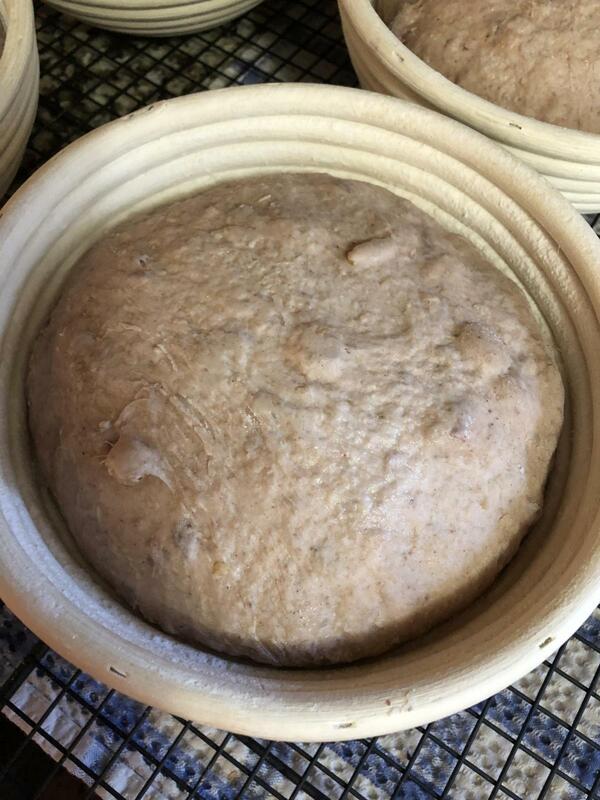 If you wish to try the cold oven/cold pot method, what I did was place the dough on top of parchment rounds in the room temperature dutch ovens. I then placed the covered pots in the oven and turned the temperature to 450 F. The oven took 23 minutes to heat up to that temperature. I left the lids on for an additional 20 minutes and then took off the lids and dropped the temperature to 425 F for an additional 22 minutes. Loaf on the left is the "hot baked loaf" and the loaf on the right is the "cold baked loaf". 1. 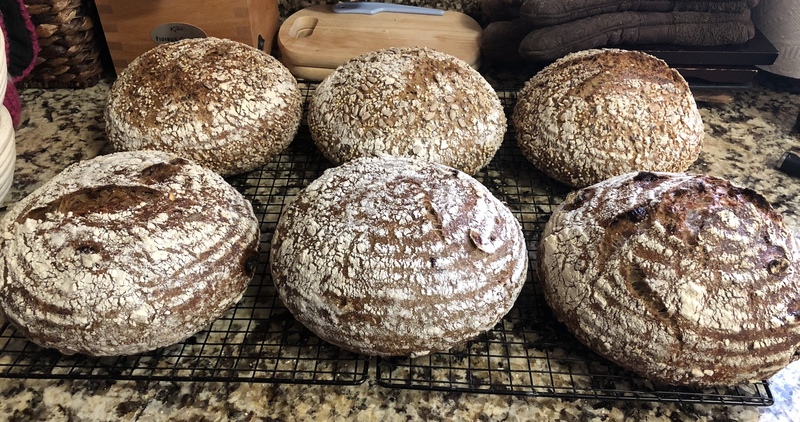 My levain builds: I went from 1:1:1, 1:0.6:0.6, 1:0.58:0.59, 1:1.4:1.76 to 1:1:1.2, 1:1.8:2.25, 1:2.5:3.19. Instead of tripling in 4-5 hours, it took 10-12 hours to slightly more than double. I am rethinking this way of doing things. 2. Bulk ferment: I usually do 3-4 sets of folds every half hour to 45 minutes during the beginning of the bulk ferment and then let the dough double. This time, I did folds every half hour to 45 minutes for the first 3 sets of folds and then did 2 more sets about an hour apart. It took the same amount of time as usual and I did really like how the dough felt when I took it out of the buckets for dividing. 3. Shaping: My normal procedure is to be fairly firm when preshaping and doing the final shaping. I pull the dough firmly and wrap it over itself. This time, I tried to be more gentle in order to keep as much of the gas as possible and instead of pulling the dough towards myself with my hands for the final rounding, I used the dough scraper to gently round it similar to what Trevor does in his videos. The dough felt like it had good tension but it wasn't as tight as when I do it with my hands. It definitely was not degassed as much as usual. 4. My sweet spot for proofing in the fridge is 10-12 hours but this time, I let it go an extra 2 hours. I didn't feel like getting up at 4 am to preheat the oven for baking at 5 am. I like my bed too much. ;-) Note to self: Get up even if you don't feel like it. So, long story short, I need to redo this recipe using my usual methods and see if I get a better looking loaf. I haven't cut into it yet to check out the crumb but the oven spring is definitely not what I would like. The loaves aren't totally flat but they sure could use a bit more lift. 1. Spout 75 g of buckwheat groats and 50 g of quinoa over 48 hours. Refrigerate until needed. 2. Toast in a dry frying pan 25 g of black sesame seeds. 3. Autolyse all above with 550 g of unbleached flour, 200 g of multigrain flour, 60 of freshly milled buckwheat flour, 142 g of Selkirk wheat flour, 50 freshly ground flax, and 725 g of water. 4. Mix in 22 g salt, 30 g organic full fat yogurt and 266 g of 80% hydration levain. Mix by hand until moderate gluten development. 5. Bulk ferment by doing 3 sets of folds 30-45 minutes apart then do two more sets an hour apart. The dough rose about 50% and felt nice and billowy. 6. Divide into ~770 g portion and pre-shape loosely. Let rest 10-15 minutes and then shape into boules. Place into bannetons and cover. 7. Proof in fridge overnight. 8. The next morning, bake right out of the fridge in a 475 F preheated oven in covered dutch ovens. Drop temp to 450F for 25 minutes and then bake for a further 20-22 minutes uncovered at 425 F.
I will have a crumb shot once I cut one of the loaves open. 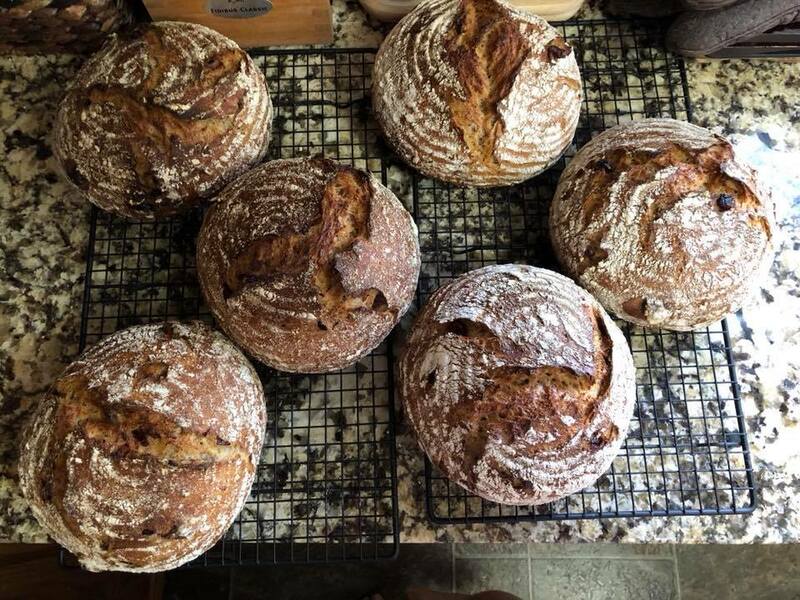 I have been wanting to make a cinnamon raisin recipe but after my last experience with cinnamon (bread took forever to rise and I found out that cinnamon impedes the growth of yeast), I have been wary of it. I found a recipe here on TFL that seemed to account for the cinnamon’s action on yeast and it had a lot of good reviews. So here is my adapted version from that adapted version from the Bourke Street Bakery Spiced Fruit Sourdough Recipe. Add all the ingredients to the mixing bowl, except salt, raisins, cinnamon and mixed spices. Mix until the ingredients are incorporated. Leave it to autolyze for one hour. Sprinkle salt over the dough surface and mix well. Fold until until a moderate gluten development is achieved. Let rest for a half hour to relax the gluten and then incorporate raisins, cinnamon powder and mixed spices into the dough until well combined. I did this by sprinkling some of the raisins, doing a fold, sprinkling more raisins, doing another fold until all the raisins were in the dough. Then I let the dough rest a bit and then did more folding to make sure the raisins and spices were evenly distributed. I did add a few grams of water here as I found the dough a tad dry. The water helped rehydrate and distribute the raisins. Leave the dough in a warm spot and cover the bowl. After one hour, do one set of stretch and folds. Let rise till doubled in size. Divide the dough into three ~830 g portions. Pre-shape the doughs into rounds and let them rest for 15-20 minutes. Shape the doughs into boules and place into bannetons and cover. Place the dough in the fridge overnight. The recipe says you can also proof at room temperature for 2 hours or until almost double in size. 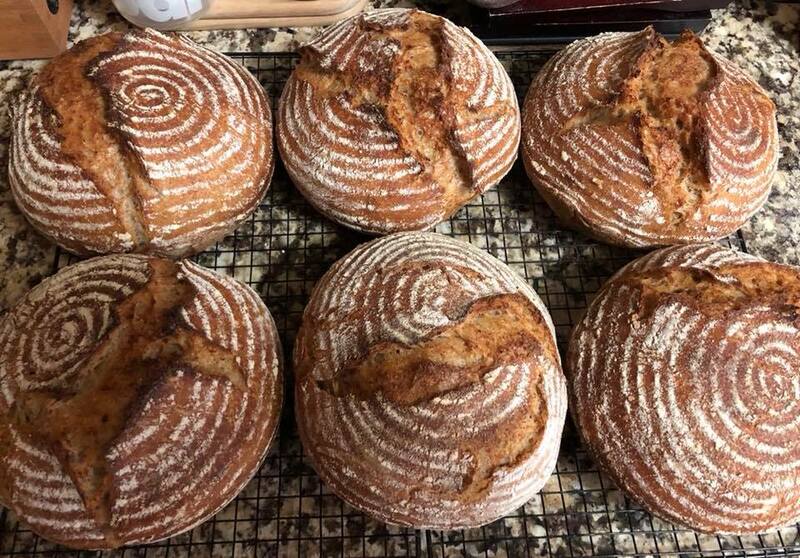 I baked some batches right out of the fridge and found I got a better oven spring than when I followed the recipe which said to let the dough rise for an additional 60-90 minutes after it came out of the fridge. I followed my usual baking method which is to preheat the oven and the dutch ovens to 475 F, load the dough into the pots (parchment rounds in the bottom of the pots prevent sticking especially with the fruit in there), drop the temp to 450 F and bake covered for 25 minutes. Uncover and bake for a further 25 minutes at 425 F.
I just had a few pieces and I must say, the spices really give it a zing in your mouth. It is super tasty and I was pleasantly surprised to see that the crumb was as open as it is. I was expecting a much tighter crumb based on the weight of the loaf.